McHale's was my neighborhood bar up to the end. And I left Hell's Kitchen not long after it closed. What a warm, welcoming place it was. Thanks for keep the memory alive Brooks. The idea of luxury living in this neighborhood still seems strange to me. Maybe it's because this was the only neighborhood I could afford in Manhattan when I first moved to the city. A fifth-floor walkup always suited me just fine. But Platinum NYC's website touts "15' plasma TV screens playing mood enhancing videos 24/7" and - yes! - a "moat of moving water". (It probably also has great views of the shivering crowds lining up for Shake Shack burgers a couple blocks away.) Sounds completely unlivable, like a dystopian movie set from Metropolis. I've always suspected that the building was actually intended to be unlivable - conceived as a holding property for foreign real-estate speculation. I still doubt many people actually live in that tower today. But I have this fantasy that if McHale's were still around, I'd buy one of those silver-dipped model residents a beer and ask them all about the 8th Avenue Luxe lifestyle. What's it like to tower over the unwashed masses? But alas, McHale's is gone, and so am I, and there's no common ground. I work in Hell's Kitchen and a lot of people's introduction to this place was in the movie "Sleepers" where they execute Kevin Bacon. I get asked about where "that bar is" a lot. "It's at 17 East 79th Street..." I tell 'em. 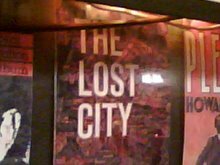 So much missed - as are the various theatres that were in the building above the bar. Haven't seen Jimmy in the neighborhood since, but I wish him well. it's a sad story. I actually knew Jimmy and really miss him. Great guy. Man do I miss this place. Classic spot. Spent five years of it being my after work spot, having worked three gigs in hell's kitchen. unbelievable food, great people the staff were good folks, and it was... man, getting misty just thinking about it. Hell, even my vegan friends loved the black bean burger there! Damn. No place like it ever again. Lived in Hell's Kitchen for almost fifteen years before leaving for Philly. Took a walk up 8th Ave. today and was shocked to discover that it was almost unrecognizable to me! It feels like a soulless stretch with much of the low rise buildings gone or slated for demolition. 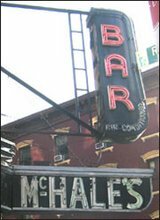 I was first introduced to McHale’s by Bob Curry, the renowned Broadway stage manager who I was interviewing for a college term paper while studying theater at Ithaca College back in 1975. Mr. Curry was the stage manager for The Whiz at the time and after the matinee, we walked down to McHale's from the Broadway Theater for a bite to eat before the evening show to what he called "Peggy's" for the "best pork chops in the city." Trust me, they were! I'll never forget that night as long as I live. While listening to Mr. Curry reminisce about his years of experience in the theater, imparting his words of wisdom to a young impressionable 19 year old kid amongst the theatrical buzz of the crowd of McHale's, I became addicted to it's magical and exhilarating energy. I would return frequently in the years to come bringing friends, relatives and anybody who I knew to share its cozy and warm ambiance in the hub of the theater district. In return, they would adopt McHale's as their own neighborhood pup even though many lived in other states or even in far away countries. I was touched and moved to tears when Jimmy kept his beloved establishment open for me in the wee small hours of the morning for a few close friends and family to conclude my Bachelor Party with a celebratory night cap. Thank you Jimmy to you and your parents for creating such wonderful place to share our lives. You are missed but McHale's will live in our hearts for as long as we can dream. Thanks for the memories. I used to work in the area and loved this place. Been living in Australia nearly 20 years now and a co-worker is about to travel over there but all my favourite places are gone now. Wah! I miss MY New York. I was a cop on 46th street In the 70's and new Peggy and her husband. At the time Roz Kelly (pinky tuscadero, Happy Days was the waitress. The pork chops were the best. Goodbye McHales and Jimmy Ray's across 8th Ave.